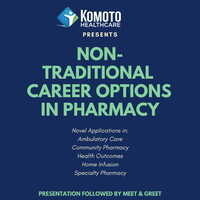 Komoto Healthcare presents: Nontraditional Career Options in Pharmacy - novel applications in ambulatory care, community pharmacy, health outcomes, home infusion and specialty pharmacy. Danielle Colayco, PharmD, MS, is the president and CEO of the Komoto Family Foundation and director of health outcomes for Komoto Healthcare. Kevin Komoto, PharmD, MBA, is the director of synergy pharmacy solutions at Komoto Healthcare. *Presentation followed by a meet and greet.